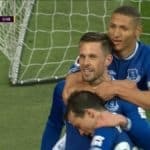 Leon OsmanÂ´s 81st minute equaliser rescues Everton a point in a 1-1 draw with Norwich at Goodison Park, preventing what would have been a third successive defeat, and a fifth home defeat in eight league games this season. David Moyes made two changes to the side which he acclaimed as having “done brilliant” in the 1-0 defeat at Arsenal. 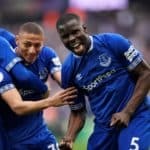 Leon Osman was brought in to replace Seamus Coleman, with Magaye Gueye handed his his first Premier League start of the season in place of Diniyar Bilyaletdinov. Everton dominated early proceedings but scuppered several chances. Fellaini had an effort well saved by Norwich Â´keeper John Ruddy, Osman saw his goal-bound cleared off the line by the backpedalling Russell Martin and Gueye also volleyed wide of the Norwich goal. But despite Everton having the lionÂ´s share of possession in the opening half-hour, it was Norwich who broke the deadlock in taking the lead courtesy of Grant Holt on 28 minutes. The 30-year-old striker turned sharply and fired low, in off the post to silence Goodison Park. 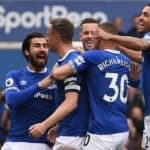 Everton huffed and puffed in response, looking typically inept in the final third and become increasingly frustrated after dominating for large spells and failing to convert any decent chance that was able to be conjured. It wasnÂ´t until the 81st minute that Everton capitalised on their territorial advantage to restore parity. Royston Drenthe, introduced just moments before, cut in well fron the right to unleash a fierce effort which was was directed by Leon Osman to go beyond keeper John Ruddy to rescue a point for Everton.